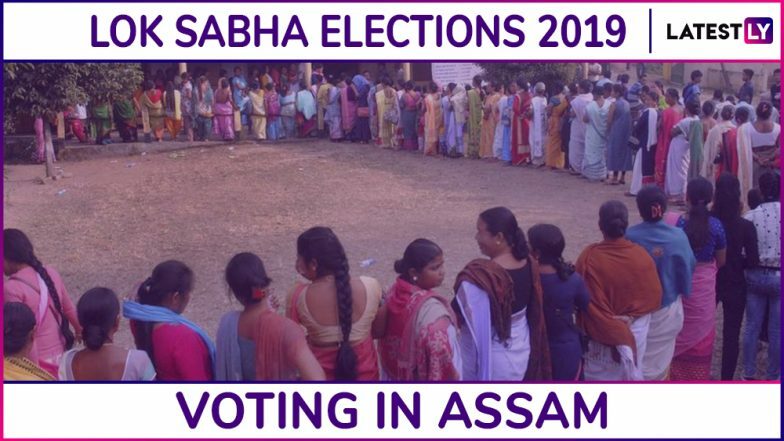 Assam, April 11: The polling for the first phase of the 2019 General Elections in five constituencies of Assam concluded on April 11, 2019. The overall voter turnout recorded across five parliamentary constituencies at the time of ending of polls was 68 percent. Complete Dates of Voting And Results For Assam General Elections. In the first phase, 104-year-old Lakhi Paul from Charaideo district, casts her vote. As per record, she could be the oldest voter in the country as she is reportedly older than Independent India’s first voter, Shyam Saran Negi aged 102. Polling began for the Dibrugarh, Jorhat, Kaliabor, Lakhimpur and Tezpur parliamentary constituencies on Thursday, at 7:00 am. Assam's Chief Minister Sarbananda Sonowal was also spotted casting his vote at a polling station in Dibrugarh. The security had been tightened in all the five constituencies that went to the General Elections 2019 polls today. In the northern state of Assam, 41 candidates contested in five constituencies. For Phase 1 Lok Sabha Elections 2019, held on April 11, the number of polling centres is 9,574, in which more than 13 lakh voters are expected to cast their votes. The major political parties participating in the 2019 Lok Sabha Elections are Indian National Congress (INC), Bharatiya Janata Party (BJP), Asom Gana Parishad (AGP), All India United Democratic Front (AIUDF), All India Trinamool Congress (AITC) and others. Voting will be conducted through the Electronic Voting Machines and VVPAT machines which have been placed at every polling booth. Lok Sabha Elections 2019 Constituency-Wise Schedule: Check The Voting Dates of Mumbai, Delhi, Chennai, Kolkata & Other Cities. In Dibrugarh, the key candidates are Rameshwar Telo (BJP) and Paban Singh Ghatowar (INC). In Jorhat, the key candidates are Kanak Gogoi (Communist Party of India), Sushanta Borgohain (INC), Topon Kumar Gogoi (BJP) and Ribulaya Gogoi (AITC). In Kaliabor, the key candidates are Gaurav Gogoi (INC), Sri Bhaskar Sarmah (Independent) and Md. Hariqul Islam Bhuyan (Asom Jana Morcha). In Lakhimpur, the key candidates Anil Borgohain (INC), Pradan Baruah (BJP), Arup Kalita (CPI) and Purna Kanta Deori (Independent). In Tezpur, the key candidates are Ziabur Rahman Khan (Independent), Mahendra Bhuyan (Nationalist Congress Party), Pallab Lochan Das (BJP) and M.G.V.K. Bhanu (INC). This year, voting for the Lok Sabha Elections 2019 will take place in seven phases. While the first phase of voting took place today, the final phase of polls is scheduled on May 19, 2019. Assam will go to the polls in three phases for its 14 Lok Sabha Seats. The final counting of votes will take place on May 23, 2019.